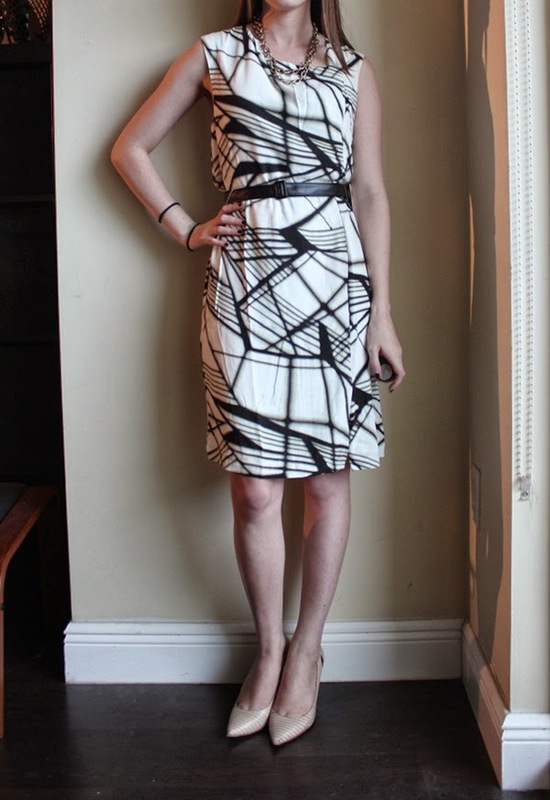 I ordered the 3.1 Phillip Lim for Target Powerline Dress when the collection first came out. When I opened the package, the first thing I noticed was that I liked the feel of the material. It is crepe and feels more work appropriate and expensive than other fabrics from the collection. 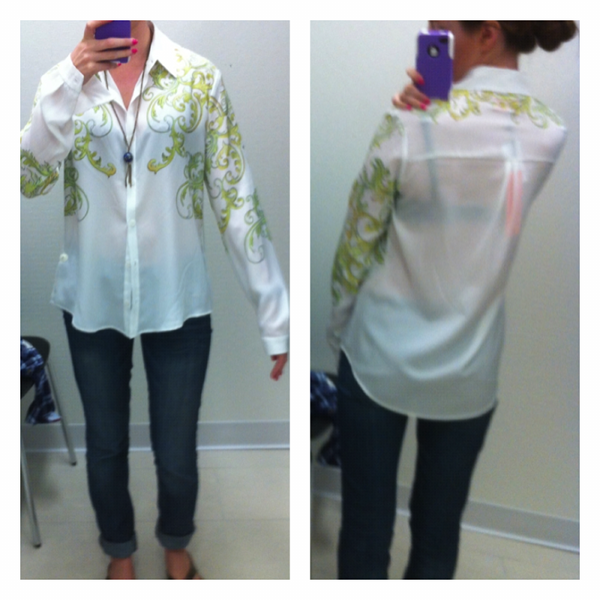 I also ordered the long-sleeve floral blouse but that was so bad (in my opinion) that it wasn't even worth a review. The material feels cheap, there were strings falling out all over the place, it's sheer, and it's very large. The faux leather belt felt a little cheap, but it was fully adjustable for all waist sizes and could easily be switched out with a belt of your choice. I also liked the faux-wrap front style of the dress for a bit of added interest. The allover pattern was also pretty. 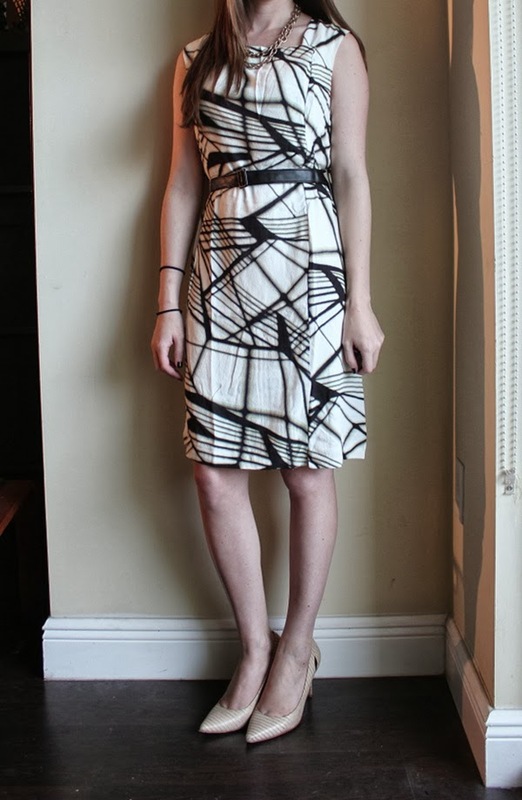 FYI, it looks black and white in these photos and online, but there are also hints of lime green/yellow-ish surrounding all of the black lines in this dress. I think it would look great with a black, grey, white/cream or camel blazer, and an array of colored cardigans for work. So everything's good, right?.... Wrong. The dress runs very, very large. This is why I never end up buying anything from these Target collaborations. The dress is $49.99 and would require extensive slimming on the sides of the dress to fit, which will probably cost me $20-25 bucks. 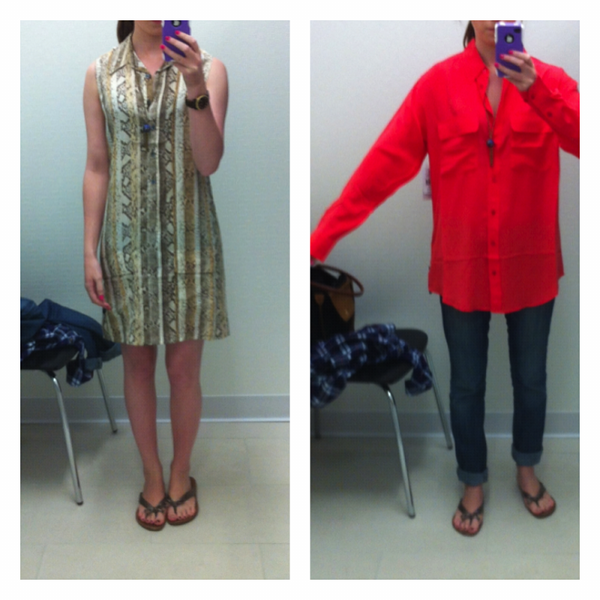 I have to decide if a TARGET dress is worth $70... right now I'm leaning toward no. 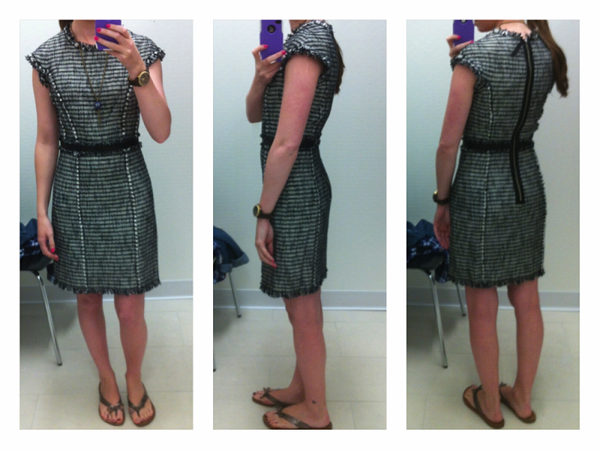 If you are lucky enough to be able to fill out this dress sans alterations, I highly recommend it for work. Did you get anything from the 3.1 Phillip Lim x Target collection? What are your thoughts on the pieces you got? Linking up with Style Elixer and Thirties Two Cents! After a little more than 1 year of working as a lawyer, I am now more aware of the holes in my closet concerning work clothes. 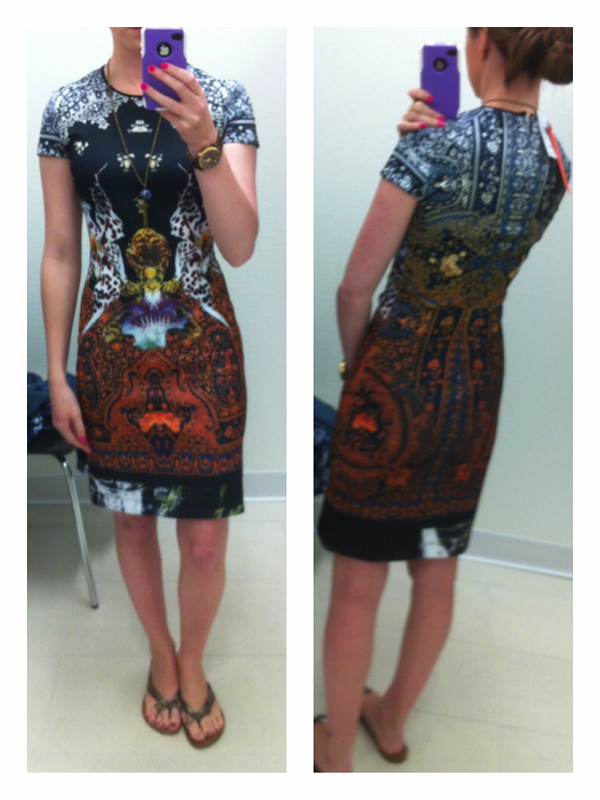 This past weekend I went to the outlet mall to look for a black sheath dress for work. I've been wearing my navy one weekly and feel like I'm wearing it out too quickly! I got distracted by some pretty, but unnecessary things, but ended up getting what I came for. 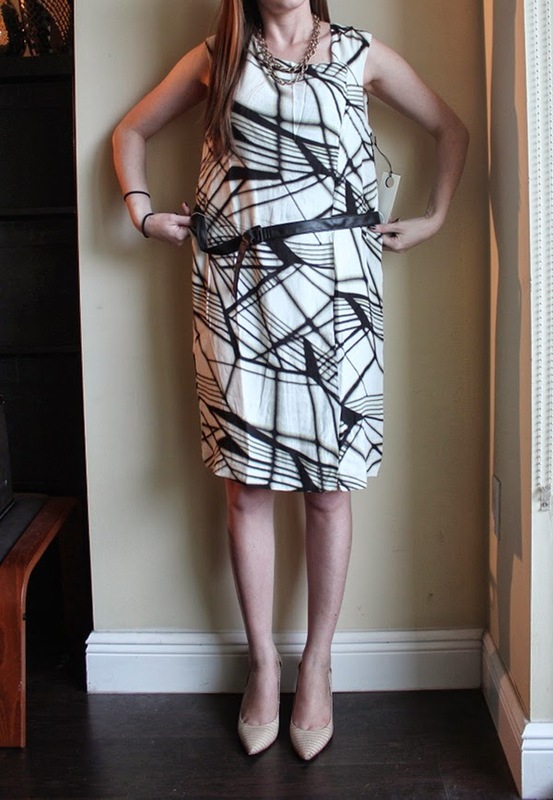 I found two Theory dresses in my size, a black and the grey one below. The grey fits without alterations, but the black needs to be slimmed on the sides. The people at Last Call assured me I could take my receipt to any Neiman Marcus or Last Call store and get free alterations, so I'm in no rush since there is one close by. Have you ever gotten free alterations done at any place like Last Call or Nordstom Rack? Would you say the quality of alterations was the same as a private tailor? I always see free alterations offered but this will be the first time I actually think to use the service. Linking up with Vodka Infused Lemonade & Mix & Match Fashion! I ordered a few items from Loft last week during a 60% off sale, and 30% off full price tops promotion. I'm currently looking for tops in fall colors (think burgundys and forest greens) as well as "flowy" tops in any color that can be worn to work and casually. If you like any of these items, Loft is currently having a 30% off everything (sale included) sale with code EVERYTHING. 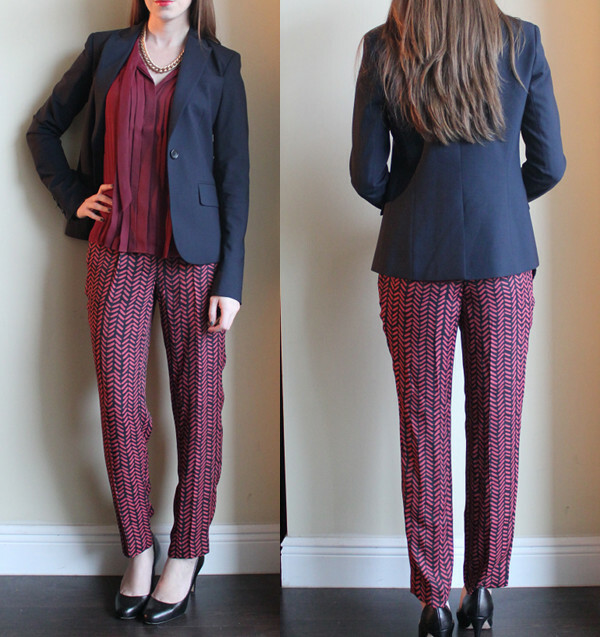 I'm also linking up with Tara at Mix and Match Fashion for the "What I Wore to Work" Linkup. 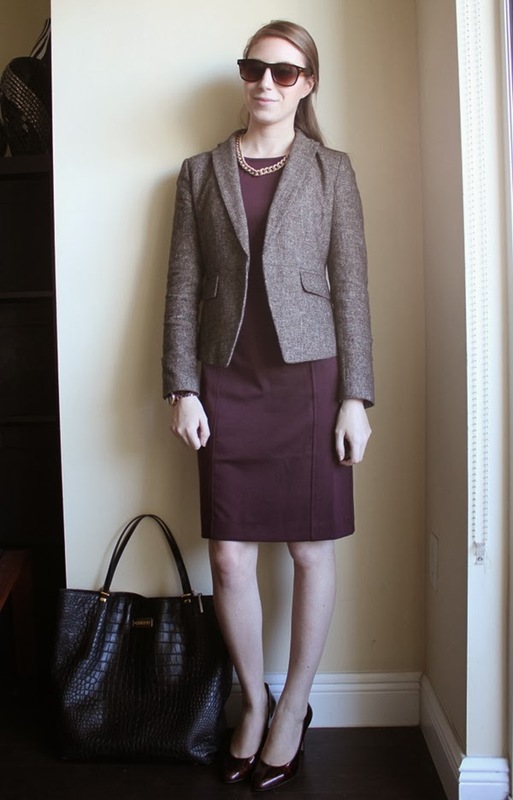 I want to start off by saying I actually like the above outfit, but I could not wear this to court (ever) and I could probably only get away with wearing it to my office on a day I see no one.. and what's the point of wearing an outfit if no one sees it? Lol. I love the color of this blouse, but after trying on a petite XXS (above and below) and the regular XS, I'm not sure which to keep, if any. 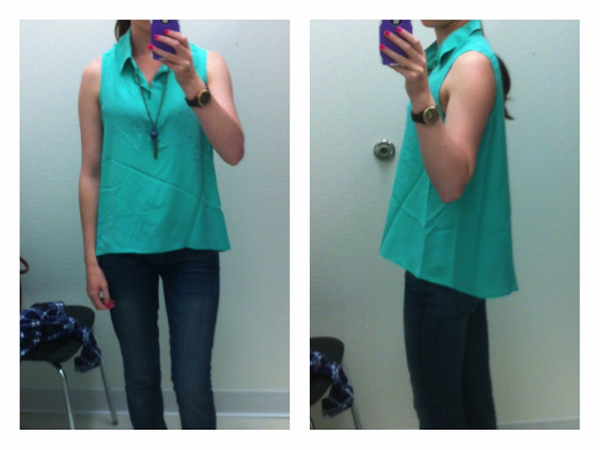 The length of the petite blouse is good for work, but the arm holes feel a bit too tight to wear casually. 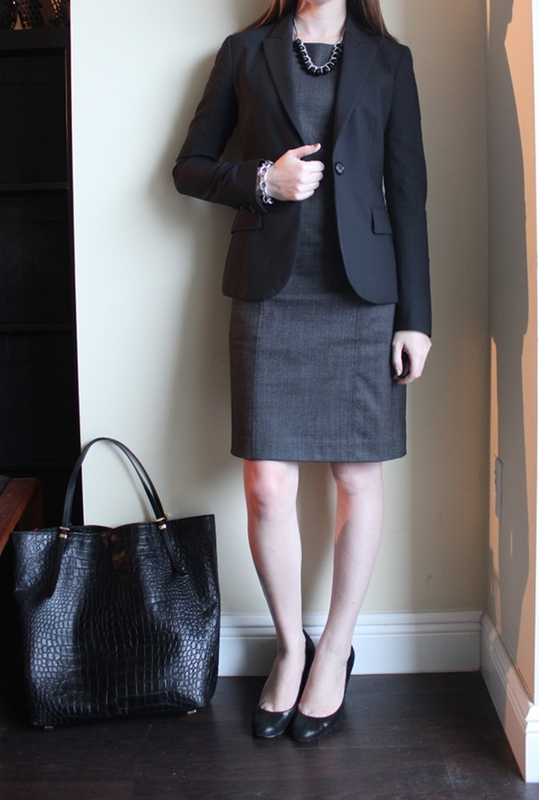 The regular size adds some length to be longer than my blazers, which means I could only wear it tucked in for work, but it will also look better casually than the shorter petite version. But, I like the option of being able to wear shirts tucked in or untucked and with this top I won't have that option if I keep the regular length. 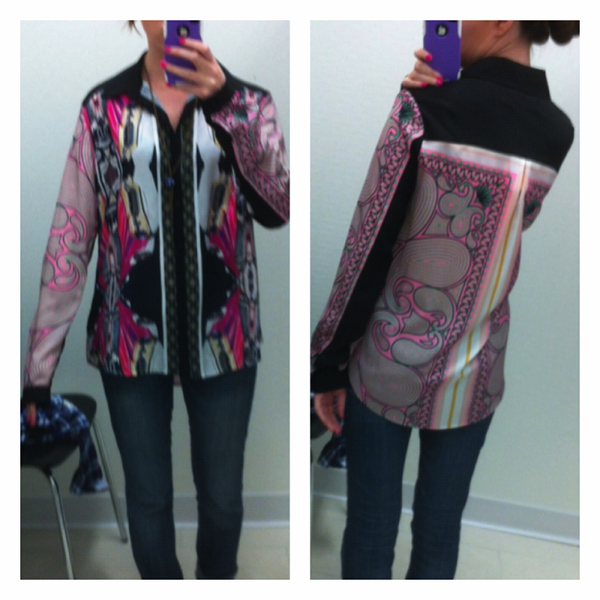 With the 30% off promo at the time, the blouse came to $35. The pants were on sale for $24. I bought them to see if I could make them work appropriate. 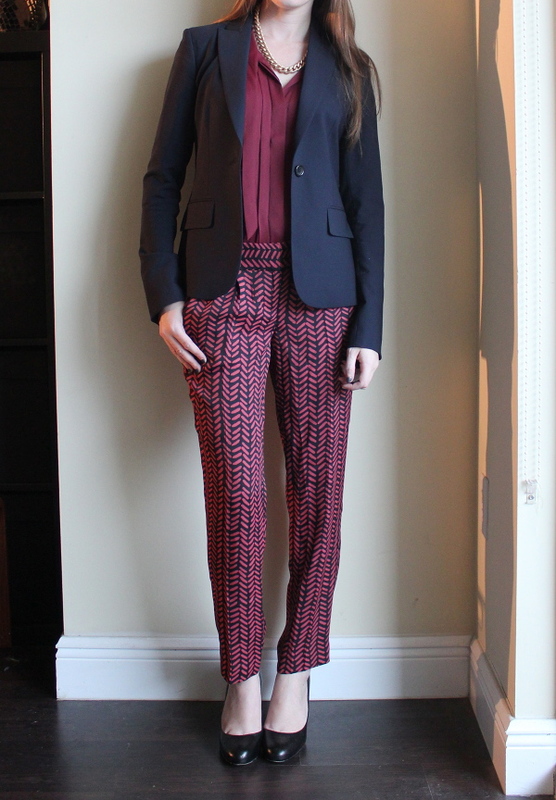 I was envisioning an outfit like above with the blazer, but the fit of the pants was not great and, in my opinion, were not worth alteration costs. The back is elasticized, which means they will fit more body sizes, but they are still big on me. The ankles could be tapered and slimmed a bit. The thigh ran a little too big. 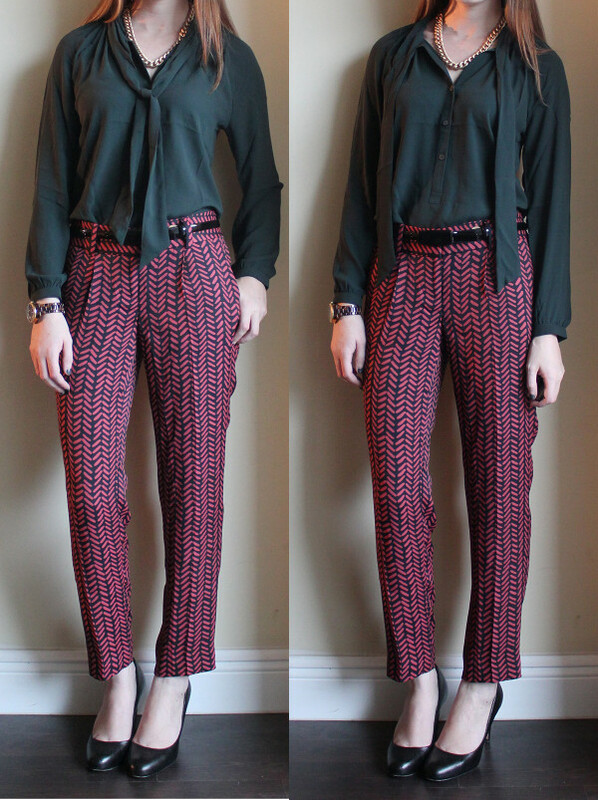 The pants come in the Marisa and Julie (curvy) fit (and I just saw the black in the new Zoe fit). The material feels like a cheap polyester, but they have a nice drape and the pattern will help to conceal wrinkles. The pants are probably worth the $24 but not much more due to the thin material and construction. Practically, I'm not sure where these pants are appropriate. I personally wouldn't wear them to work after trying them out above and below, and they are a bit too loose/not flattering enough to wear casually. FYI if you like these pants but don't love the color I chose, they have a bunch of other colors available right now in the same style: red paisley print, plain black, blue floral, black speckle. I thought maybe a belt would fix the fit of the pants, but meh. I like the color of the green Pleated Tie Neck Blouse, but I wish it were a little more green. I'm wearing the regular size. The petite size runs VERY small, with the arms being about 2 inches shorter than these arms, and the shoulders running very tight. I think I'll get more use out of a sleeveless blouse (feels more comfortable under jackets for work, and is more casual for weekends), so I am probably going to return this blouse and hold out for a more true forest green color. 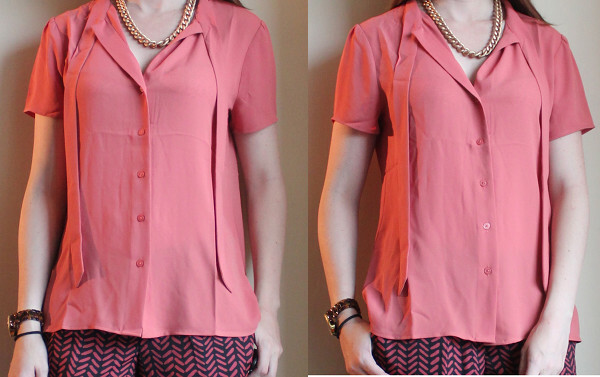 This Short Sleeve Tie Neck blouse is currently on sale. It also comes in white but I tried the white on in the store and it is VERY sheer. This "faded rose" color is pretty opaque but a patterned bra will show through a little bit. The shirt runs short, in my opinion. This is the regular length and it is about the same length as the petite shirts that I ordered, the petite was too boxy and short on me. It was only $16 after the sale and will make a good work shirt so I will probably keep it. Let me know if you shop the Loft sale and what you bought! I'm kind of an impulsive person on the weekends. I don't usually have serious plans because my BF lives in another state, so I generally wake up and lay around for a while and suddenly decide what I'm going to do. This weekend I woke up, it was raining so I couldn't take my dog to the park, nor did I want to walk anywhere, so I decided on the whim to drive up to Ikea. I'll have a post about what I bought at Ikea and a little weekend art project another day. Anyway, instead of taking a lot of time to pick out my outfit, I immediately grabbed the first pair of jeans that I found in my drawer - my mint pair. Then I figured it was going to be cold and air conditioned inside Ikea so I wanted to be warm - and voila, I chose a flannel shirt. I'm actually liking this color combination. After all, mint is a shade of green, so since the forest green of the shirt and the mint green of the pants share the same color family I don't think it looks terrible. 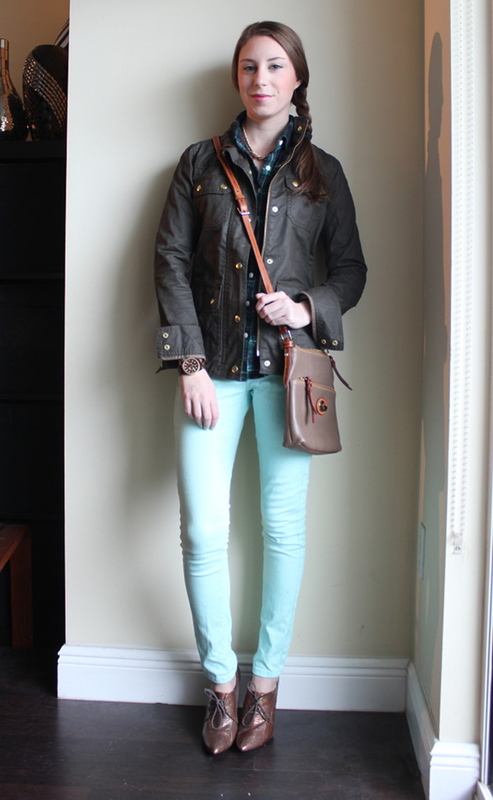 Plus, now I have a new, darker combination to help transition these mostly "spring and summer" jeans into fall! I think the copper booties and the field jacket also help with the fall vibe. 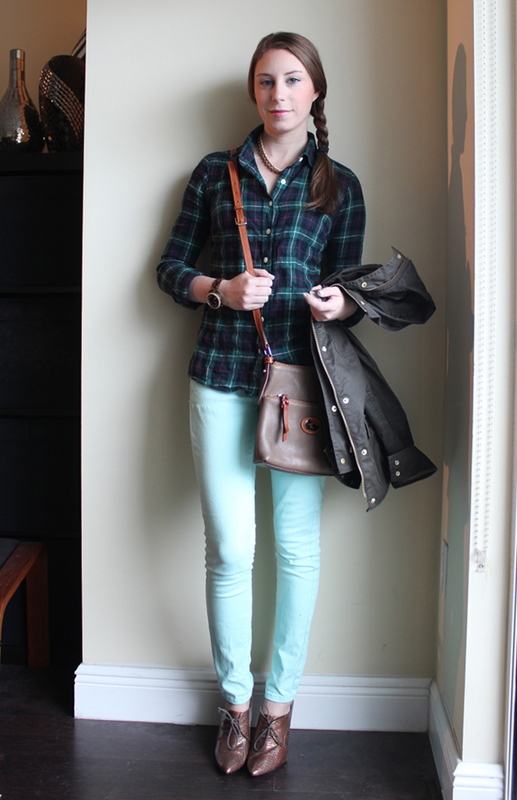 How are you going to transition your summer colored jeans to fall? Or are you just planning to pack them up until next spring?? P.S. - I know it seems insane to wear heels to Ikea, but I wasn't going there for the whole "experience" - I was there for less than 30 minutes because I knew exactly what I was looking for - some picture frames and a new rug! Unfortunately the back and forth drive was longer than the whole time I spent in the store, lol. Anyway, after "pizza", my BF and I kind of wandered around trying to find some bar to go to. He lives in an area of town that isn't known for its nightlife so we weren't sure where to go. We ended up venturing to Public House because it's a chain and the one in Philly is fun. Then we wandered down the street and found a street that seemed pretty bustling with a bunch of bars. We ended up going to El Hefe for the rest of the night. Their website classifies themselves as a nightclub but to me this was just a bar.. but maybe this is what "clubs" are like in Chicago? - not sure. I noticed nobody really fist pumps in Chicago. What's up with that??!? About my outfit: I hope I don't look like "Halloween" in these pics, lol. Wearing orange and black together can be a recipe for disaster but hopefully this is not one. I missed this jacket for many months because it's so hot in Miami and I was glad to be able to wear it in Chicago (even though it was definitely hotter than I thought it would be at night). Also, FYI, there were about 15 GIANT SPIDERS hanging all around me during these photos. It took everything I had to stay out there for 1 minute to take the pics. BF needs to buy some Raid or something! So gross! I spent Labor Day weekend visiting my BF in Chicago. Without the pressure to do "touristy" things we had a great time just doing whatever we wanted to! On Saturday we went to brunch at this place called Eggy's which we went to last time I was in town. It was raining all morning and the weather report called for rain in the afternoon and I was so upset that it was going to be bad weather. I originally wore the outfit below, but with all the rain, when we went back to his apartment to change for the rest of the day I added a sweater and leather jacket. Thankfully, the rain stopped about mid day so I was able to ditch the jacket. We spent the day just walking around downtown Chicago. It's amazing how crappy the shopping is in Miami compared to Chicago. We stopped into All Saints - it was my first time in a brick and mortar store. I loved all the leathers! A bit (a lot) out of my price range though, but the sales associate said they have sales about twice a year. We also stopped into Zara and Nordstrom Rack. The Zara was amazing. The Nordstrom Rack was also amazing but it was really crowded probably because of the holiday. I always wonder how people always get such great things at The Rack since I NEVER find quality designer items in my size at the one in Miami. I know if I had more time to search through the racks at the Chicago store I would have found something to buy. As it was, I found at least 5 things in my size from great designers (DVF and Theory to name a few) that I was close to buying but didn't pull the trigger. I'll update with my other outfit from the trip another day! What did you do this labor day weekend? Hopefully you had fun!